Frances Hodgson Burnett?s beloved victorian classic, The Secret Garden, blossoms anew in this enchanting musical by Pulitzer Prize-winner Marsha Norman and Lucy Simon. When young Mary Lennox loses her parents to a cholera outbreak in India, she is sent to live with her uncle, hermit Archibald Craven, who lives in an imposing, secluded manor on the British heath. Inside the haunting house upon the hill, Mary finds a reclusive, long-suffering collection of souls. Since her Aunt Lily?s death, Mary?s uncle has pushed away his surviving loved ones, leaving his bedridden son, Colin, alone. Sickly Colin, hidden away in the depths of the manner, bears the guilt of his mother?s death on his crippled shoulders. When Mary discovers her Aunt Lily?s hidden garden, locked shut and overgrown with vines, stubborn Mary is determined to revive the beauty that once was. Surrounded by spirits from the past, who both warn and welcome her, determined Mary begins to peel away the layers of sadness that cover the house and the garden, showing us the power that ?one small girl? can have when she ?wants things to grow.? Audition pieces will be made available on the night for you to read before the audition so please come early and be prepared for what could be a long evening. ?For all singing roles you can bring a song of your choice which requires a legit/classical voice rather than a pop/rock/contemporary musical theatre style. ?The piece should be no more than 3 mins long and you must bring sheet music with any cuts clearly marked. 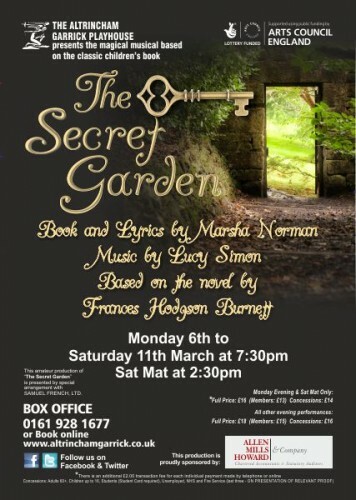 To register your interest please email admin@altrinchamgarrick.co.uk and put ?SECRET GARDEN? ?as the subject. LILY ? Mary?s aunt, Mr. Cravens wife, now dead (18-30) Soprano. MARY LENNOX ? a ten year old girl Mezzo. MRS. MEDLOCK ? Mr. Craven?s Housekeeper (30-70) non-singing. DR. NEVILLE CRAVEN -Mr. Craven?s brother (25-45) Baritone. MARTHA ? a housemaid (16-25) Mezzo. ARCHIBALD CRAVEN ? Mary?s uncle, and lord of Misselthwaite Manor (25-45) Tenor. BEN WEATHERSTAFF ? head gardener (45-75) Tenor. DICKON ? Martha?s brother (16-25) Tenor. COLIN CRAVEN ? Archibald?s Craven?s ten-year old son Soprano. MRS. WINTHROP ? headmistress (30-70) non-singing. JANE ? nurse/maid (15-20) non-singing. ROSE LENNOX ? Mary?s Mother (20-45) Mezzo. CAPTAIN ALBERT LENNOX ? Mary?s father (20-45) Tenor. ALICE ? Rose?s friend (20-45) Soprano. LIEUTENANT WRIGHT ? officer in Mary?s father?s unit (20-45) Baritone. LIEUTENANT SHAW ? fellow office (20-45) Tenor. MAJOR SHELLEY ? officer (20-45) Baritone. MRS. SHELLEY ? Major Shelley?s wife (20-45) Soprano. MAJOR HOLMES ? officer (20-45) Bass. CLAIRE HOLMES ? Major Holmes wife (20-45) Soprano. AYAH ? Mary?s Indian nanny (15-40) Alto.